Top 40, mash-ups, and dance. Mandalay Bay Beach features more than 11 acres of sandy beaches, soothing water, and entertainment options galore. The outdoor venue includes a lush water environment enhanced with a sand-and-surf beach, four pools, a lazy river ride, a jogging track, and an incredible wave pool with the ability to create waves up to six feet tall. The more than 2,700 tons of beach is composed of real California sand, perfect for sunbathing. If you’re in Las Vegas, don’t miss out on a chance to visit this European-style beach club. 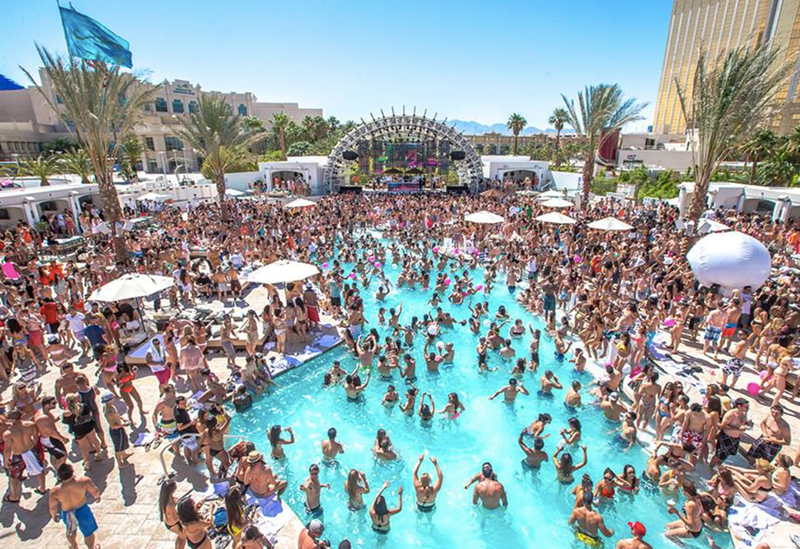 When the weather gets hot, locals and tourists alike spend time at some of Las Vegas’ most popular pool party spots. Sin City is in the middle of the desert, ensuring a long summer of high temperatures and people looking for ways to cool down. While most day clubs offer the convenience of multiple swimming pools, Mandalay Bay takes it one step further by offering a realistic beach environment with extra perks. The pool complex is surrounded by tropical palm trees, waterfalls and fountains. The venue has a total of eight pools, including the real sand beach, wave pool, and traditional pools. Mandalay Bay offers a world-famous aquatic playground in the heart of Las Vegas. Voted by Trip Advisor as one of the best pools in the United States, the venue offers everything from a 1.6 million gallon wave pool to a lazy river with a 3 mph current. If you take a look around, you’ll also find other places to keep your interest, including a retail shop, beachside casino, bars, and restaurants. The staff is also very accommodating, whether you’re in need of a spacious beach for your family event or a sophisticated party scene for a 21+ group. For your comfort, you can find about 1,200 chaise lounges, 400 chairs, and 100 cabanas and gazebos, all at varying prices and reservation availabilities. The spacious cabanas offer a wide range of services, including your personal cabana host, massages, in-cabana dining, and food server. The cabana is also equipped with a flat screen TV, ceiling fan, and fridge. Cabanas can be found on the beach or by the lazy river. The beach bungalows are also a popular choice, offering plenty of space to lounge about. They can be conveniently found on the beach below Moorea Beach Club. For the ultimate in amenities and privacy, rent one of the garden bungalows. Each features a 37 inch flat screen TV, mp3 player, secure cabinet, safe, ceiling fan, telephone, changing area, and refrigerator stocked with bottled water, ice and sodas. The bungalows also features their own private pool area with two whirlpools and private restrooms. During your stay, a cabana host will bring you fresh towels and personalized service, including massages, food and drink. When you first arrive to the venue, you may notice a rental center at the pool entrance. Stop in to gain access to rafts, inner tubes, and cabana and gazebo rentals. Visit from March through October to see live concerts on the Mandalay Beach Stage, which rises over the wave pool. Bring along a comfy blanket and sit on the beach while you enjoy the live entertainment. Want to get way from the kids for a bit? The Moorea Beach Club offers an adults-only escape, and is located off the second floor of the pool area’s beach tower. The Villa Soleil on the third floor is also an adults-only area. To gain entry, you need a key-card. Also make time to stop at the three-story glass-fronted beachside casino, where dealers are encouraged to dress in beach attire and where you can gamble barefoot while sporting beach shorts or a bikini.